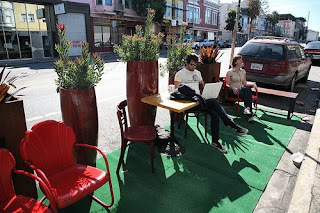 September 19th is National PARK(ing) Day a movement that began in San Francisco. National PARK(ing) Day is an opportunity to celebrate parks in cities and promote the need for more parks by creating temporary public parks in public parking spaces. It was concept created by San Francisco art collective Rebar in 2005 to re-imagine the potential of the metered parking space. This year National PARK(ing) Day will kick off in full force in Philadelphia, the Bicycle Coalition team will be running a bike sharing demonstration project at two locations. 33rd and Spruce 34th and Walnut AND 16th and Locust. Details are sketchy but it will be likely be free the no charge and maximum rental period will probably be 1 hour.and that a credit card and ID will be required to hire the bikes. You can drop off your bike at either station. http://blog.parkingdayphilly.com/ and the Trust for Public Land website.